Before you start with these exercises, let the physiotherapist go through them with you to make sure that you do them correctly. Then the therapist can adapt them if necessary. Your exercises must be done 2-3 times a day. Stretches and exercises must not cause any pain. If any of the exercises or stretches cause any pain, reduce the intensity. If it still continues to cause pain, stop immediately and contact your therapist. Lie on your back. Loosen your leg muscles by bending and straightening your knee, while your heel glides on the mat (one leg at a time). Repeat 10 times on both sides. This exercise must be done before and after every exercise session for the following 6 weeks. The following is applicable for all the stretches through all 3 the phases. Maintain each stretch for 30 seconds. Only a slight strain must be felt, but no pain. At the end of every stretch, repeat the loosening exercise. Lie on your back and bend both knees. Put both your hands behind your right knee. Pull your leg towards your chest, and hold the stretch for at least 30 seconds as for all stretches. A slight pull will be felt over the buttocks area. Repeat the stretch on the left side. Remember to keep your neck muscles relaxed while performing the stretch! Your right shoulder must touch the mat at all times. Put your left hand on the outside of your right thigh, roll both knees to the left and hold the stretch. Use your left hand to maintain the position of your legs. You will feel a pull on the right side, but no pain should be felt on the left side. Repeat on the opposite side; left hand behind your head and rolling your knees to the right. Hold the stretch. Use your right hand to maintain the position of your legs. The following exercises are intended to strengthen the stomach and back muscles. As the muscles get stronger, progression can be done by doing more repetitions and/or hold the contractions for longer. Bend both knees while your feet stay on the mat. Put both hands on your pelvic bone, over the lower stomach muscles. Exhale and then pull your navel slowly in and up towards your spine, and feel how your stomach muscles contract. Now breathe normally without relaxing the stomach muscle contraction. The physiotherapist must make sure that you do this activity correctly. Hold the contraction for 10 seconds and repeat 20 times. Progression on Exercise 1. Do the same as in Exercise 1 by tugging in your navel. Now also tighten your buttocks and pelvic floor muscles; therefore stabilising your pelvis. Hold the contraction for 10 seconds and repeat 10 times. The same starting position as Exercise 1. Put your right hand on your left thigh, and push your knee in the direction of your feet. Hold the contraction for 10 seconds. You will feel how the stabilising stomach muscles contract. No movement must take place. Repeat the exercise with your left hand on your right thigh. Hold the contraction for 10 seconds. Repeat 10 times on both sides, alternatively. Relax your neck muscles while performing this exercise! Do not do all the repetitions on one side and then all of them on the other side. Alternate sides after every one! Place a pillow under your knees for comfort. Press the left arm and right leg down into the mat. Hold the contraction for 10 seconds. Do the same on the opposite side; with the right arm and left leg. Hold the contraction for 10 seconds. Repeat 10 times on both sides, alternatively. Do not do all the repetitions on one side and then all of them on the other side. Alternate sides after every one! Put both your hands behind your right knee and pull your knee towards your chest until your hip is at a 90º angle. Straighten your right knee until you feel a slight sensation in the lower back, thigh or behind the knee. Now slowly bend your knee until you just do not feel the sensation anymore. No pain or discomfort must be felt. Hold this position for 2 seconds and then bend your knee again. Repeat the movement 15 times short of symptoms. Do exactly the same with your left leg. Do the same stretches as for Phase 1 and add the following. Stand with your knees slightly bent against the wall. Your shoulders, the lower back and the heels must touch the wall at all time. Bend sideways to the right and glide with your hand down your right thigh until you feel a slight pull on the left. No pain or discomfort is allowed on the right side. Repeat towards the left side. Continue doing the exercises of Phase 1 and add the following. Lie on your back with your knees bent and your feet on the mat. Stabilise the pelvis by contracting the buttock and pelvic floor muscles and the navel in and upwards. Now lift your buttocks just off the surface. As your strength increases you may lift your buttocks higher, but do not extend your back. Hold the contraction for 10 seconds and then descend slowly. Repeat the action 10 times. Lie on your stomach with pillows under your stomach and ankles. Put your arms straight above your head and stretch them parallel to the mat. Lift your hands slightly off the mat so that they just don’t touch. Your hands are not allowed to clear the mat for more than 1 cm. Hold the contraction of 10 seconds and repeat 10 times. Continue with the stretches of the previous weeks and add the following. Stand with your left side facing the wall. Put both hands on the wall with your left hand shoulder height and your right hand over your head. Push your hips away from the wall without moving your feet and hold the position. You will feel a pull on your right side, but no pain or discomfort must be felt. Repeat the stretch on the opposite side. Continue with the exercises of the previous phases and add the following. Lie on your back with your knees bent. Hold a ball with your hands on your stomach. Stabilise the pelvis by tugging in your navel. 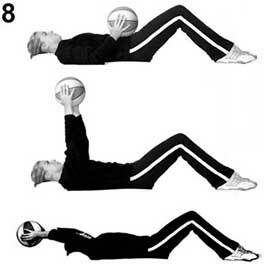 Push the ball up towards the ceiling until your elbows are straight. Move the ball slowly over your head to the mat or as far as possible and then slowly back again without loosing the position of your pelvis. Repeat 15 times. The same position as Exercise 8. 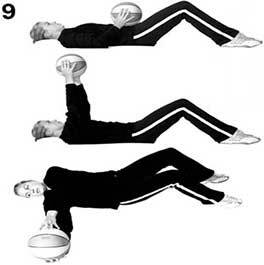 After pushing the ball towards the ceiling, move the ball as far as possible to the left and then to the right. Maintain the position of the pelvis at all times. Repeat 10 times to both sides. Tug your navel in and upwards as shown before. Tighten your buttock and pelvic floor muscles. Maintain the position of the pelvis at all times. Hold the contraction for 10 seconds. Repeat 15 times. The same starting position as Exercise 10. Lift your right arm forward in the same line as your body. Remember to stabilise your pelvis and don’t tilt it. The stick must stay in position. Hold the position for 10 seconds. Repeat the same with the left arm. Repeat 10 times alternatively on both sides. Lift your right leg straight backwards in the same line as your body. Stabilise the pelvis and don’t tilt it. The stick must stay in position. Hold the position for 10 seconds. Do exactly the same on the left. Only after 6 weeks and when all the other exercises are performed effortlessly. Lift the right arm forward and left leg backward simultaneously. Keep your pelvis stabilised. The stick must stay in position. Repeat now with your left arm and right leg. Remember that the stretches and exercises must not cause any pain. If any of the exercises or stretches cause any pain, reduce the intensity. If it still continues to cause pain, stop immediately and contact your therapist.